Whether or not you use cryptocurrencies, you most likely have heard of Bitcoin, the most popular cryptocurrency platform in the world. Bitcoins have become one of the fastest growing digital currencies, and as of writing, it holds 62.01% of the total market capitalization of all cryptocurrencies in existence. That’s over four times the market capitalization of Ethereum, the second most popular cryptocurrency, at 14.31%. If you’re a business, it would definitely be in your best interest to look into bitcoins and adopt it as a mode of payment, as it is also a popular payment option and its adoption rate among the online community is rapidly growing. In a previous article from our blog, we looked into Blockchain developers and Blockchain in general, one of the third party providers of Bitcoin services. In this article, we take a closer look at Bitcoin and see why there’s such an intense interest in the currency across different industries. Bitcoin is the first ever decentralized digital currency, which refers to a currency that does not need a central administrative system to regulate it and verify transactions. It was created in 2009 by a person or group who went by the name Satoshi Nakamoto, whose real-world identity remains unknown. Nakamoto was the first to design and implement a decentralized model for digital currency. Decentralization implies that instead of having a regulatory body that mediates transactions, the task of validating and regulating transactions is distributed across a network of computers, all of which run the same software and follow the same set of protocols. This is achieved through a technology called the block chain, which serves as a public record of all bitcoin transactions. Bitcoin’s popularity is rapidly growing. From just over a hundred daily transactions during its first year of operation, there are now currently around 300,000 daily Bitcoin transactions. 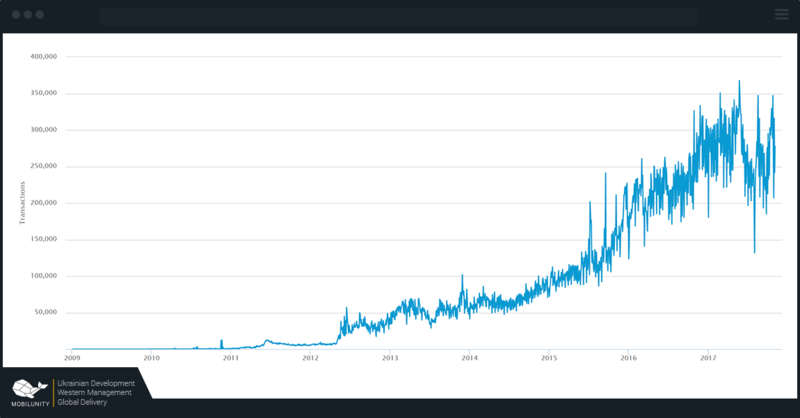 What’s even more spectacular is that its market price: from less than a dollar per bitcoin in 2010, a single bitcoin now costs over 7,000 USD, and this amount continues to grow by the minute. This shows just how large the demand for bitcoins is now, and this demand just keeps on growing. With Bitcoin quickly penetrating the online community, it would be wise for businesses to support this currency and integrate it into their business operations. This is best done by hiring a good Bitcoin developer. A single bitcoin can be broken down into 100,000,000 units, called a satoshi. A bitcoin transaction involves the process of transferring satoshis from one user to another. Bitcoin transactions are made up of several small processes, the details of which may be found in their Developer Guide. As many online stores accept bitcoins as a mode of payment, processing such payments is also a standard functionality that Bitcoin developers can integrate into applications. Payment processing includes the simple steps of requesting and making payments, as well as the more complex aspects such as requesting for refunds and scheduling regular billings. Bitcoin wallets work a lot like digital wallets: they allow you to store and track your digital currency — in this case, your bitcoins — and spend it when you please. In the case of Bitcoin wallets, developers can either create a Bitcoin wallet program or file which stores your bitcoin information such as private keys, generate public keys, and store other information related to your transactions. The block chain, which is a big part of the backbone that powers the entire Bitcoin platform, is a public ledger that stores all information about all the transactions since the creation of Bitcoin. Due to the public and distributed nature of the block chain, it becomes difficult, nearly impossible, to modify transaction details without having to disrupt and modify the rest of the network. Bitcoin developers can access information on the block chain to verify transactions. You may read an ultimate guide on Blockchain and bitcoin development in Invest in Blockchain blog with more detailed information and research on this topic. As bitcoins become increasingly popular and are adopted by a growing number of businesses as a form of payment, Bitcoin software development becomes more and more in demand in various industries. This increase in demand subsequently raises the salaries of Bitcoin developers. Wider acceptance of bitcoins as a currency – As more people adopt bitcoins as a digital currency and payment option, more people will be considering adopting the currency as well. In addition, this will also put a pressure on businesses to adopt the currency and accept it as payment, since not doing so may cause them to miss out on potential customers or clients. Rapid increase in market price – The market price of bitcoins has soared at an incredibly quick pace, and it has become an attractive opportunity for investment that can yield much greater returns than traditional investment methods. As prices continue to soar, more and more people become drawn into the currency, whether they plan to use it as a currency or as a mere investment option. More presence in the news – As news about bitcoins reaching all-time highs and becoming highly profitable for many investors, the reputation of Bitcoin as a secure and viable digital currency becomes more widespread, and this can pique the interest of many who may have previously doubted Bitcoin’s viability. This can further expand Bitcoin’s user base and increase the demand for bitcoins. With all these factors happening simultaneously, the demand for bitcoins is certain to continue rising, and so will the salary of Bitcoin developers. For instance, according to Indeed, the average salary of Bitcoin developers in the United States ranges from $91,433 to $110,611, which is well above typical developer salary ranges in the country. If you wish to adopt bitcoins into your business, it will be best to do so in the earliest possible time to avoid having to pay ridiculously high costs. Hiring a Bitcoin developer as early as possible can help reduce the cost, but to further save on expenses, it will be wise to also carefully choose which country to hire your developer from. For that purpose, let’s compare the salaries of developers in different countries. For this comparison, we use PayScale as the source of our data. 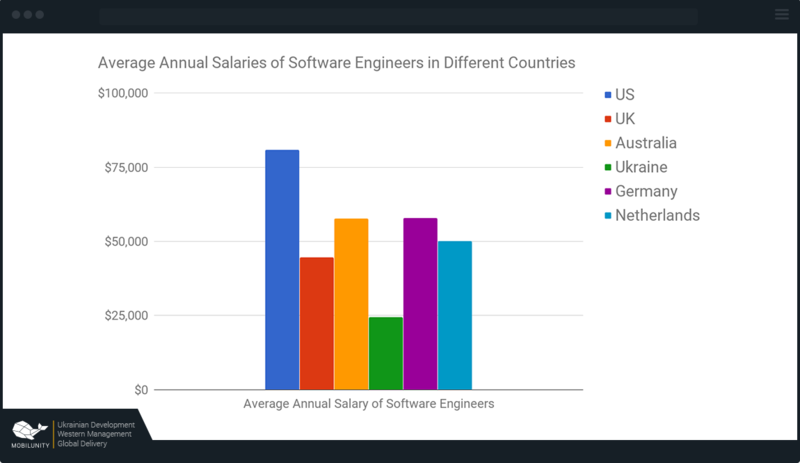 Note that since no data specific to Bitcoin developer salary is available, we instead compare the salaries of software engineers, of which Bitcoin developers are a subset. Moreover, note that the values we obtain are self-reported average gross salaries. As such, the figures we obtain are by no means accurate salaries of Bitcoin developers, but we nevertheless get a relative comparison of the cost of hiring developers, including Bitcoin developers, in different countries. The comparison above clearly shows that Ukraine offers the most affordable rates for developers, so hiring Bitcoin developers from Ukraine will be your most practical option. With the rapid rise in the popularity of Bitcoin and other cryptocurrencies, the demand for Bitcoin software development and Bitcoin app integration continues to climb. We have seen why the cost of Bitcoin and cryptocurrency development is subsequently rising and continues to increase, and we’ve given some tips on the most economical way to go about hiring Bitcoin developers. Now, it’s time to hire! Luckily, we’ve got just what you need. At Mobilunity, we have excellent Bitcoin and cryptocurrency developers who can smoothly and easily create a Bitcoin app for your business. We are located in Ukraine, in the heart of Europe, so not only are our developers one of Europe’s best IT talents, we also offer one of the lowest rates you can find on the continent! Reach out to us now and let’s bring your business to the forefront of technology.